Execute migrations to AWS by capturing your host server, configuration, storage, and network states, and then provisioning and configuring your AWS target resources. Businesses require the flexibility and security to migrate mission-critical applications to the cloud—and the assurance that it will be done correctly with 100 percent data integrity. A workload mobility solution can help you securely transition to a cloud environment by automating migration and reducing risk of human error. Automation provides a level of consistency, which extends to repeatability, and thus results in better-quality application services. CloudEndure LiveMigration is a cloud migration automation service designed to migrate your applications—whether physical, virtualized, cloud-based, or mixed—to the cloud, easily and with near-zero downtime. 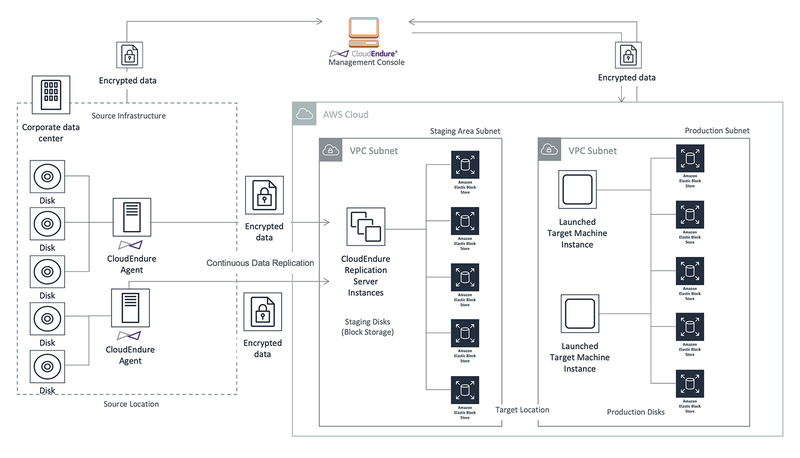 Using continuous, block-level replication, automated machine conversion, and application stack orchestration, CloudEndure simplifies the migration process and reduces the potential for human error. CloudEndure creates a block-level, continuous replication of any workload into a lightweight staging area and tests to ensure the replica works properly before moving workloads over to AWS. Clark Construction set a goal to shift the applications and data from 50 servers to AWS. The company’s IT department wanted to spend more time on business operations and less time operating a data center and hardware facilities. CloudEndure successfully replicated 26 applications for Clark Construction within a few days, allowing the company’s network engineering team to test their servers quickly and without disruption to source applications. Clark Construction was able to complete its applications and data cutover in minutes and shut off its in-house servers. We would not have finished the migration in time had we not used CloudEndure. There was no way we would have finished the way we did without them.